BACKGROUND This is the new HALDOR Armis 2000m, released as a collection of three models that include: the Armis 2000m HHC, DLC and Ceramic. The Armis is the Slovenian brand’s second model and one which follows in the footsteps of their popular debut diver, the ABISSI. If I remember correctly, I had some pretty good things to say about the Abissi so let's see what I make of the Armis. ARMIS The Armis collection of 3 includes this model, the Ceramic named so after the ceramic diver's bezel that it is equipped with, the HHC taking its name from the HALDOR Hard Coating that its case (and also the case of the Armis Ceramic) is finished with, and the DLC named so after its black Diamond Like Carbon treated case. The case and all of it components such as its: bezel, case-back, crown and bracelet (incl. clasp) have all been treated with HALDOR Hard Coating. is a special hardening process designed to increase the scratch-resistance and hardness of steel. The process creates a hardened barrier of roughly 25 microns deep on the upper layer of the steel making it considerably harder. HALDOR’s Hard Coating has about 2000HV (Vickers) making it 7 times harder than normal Stainless steel. 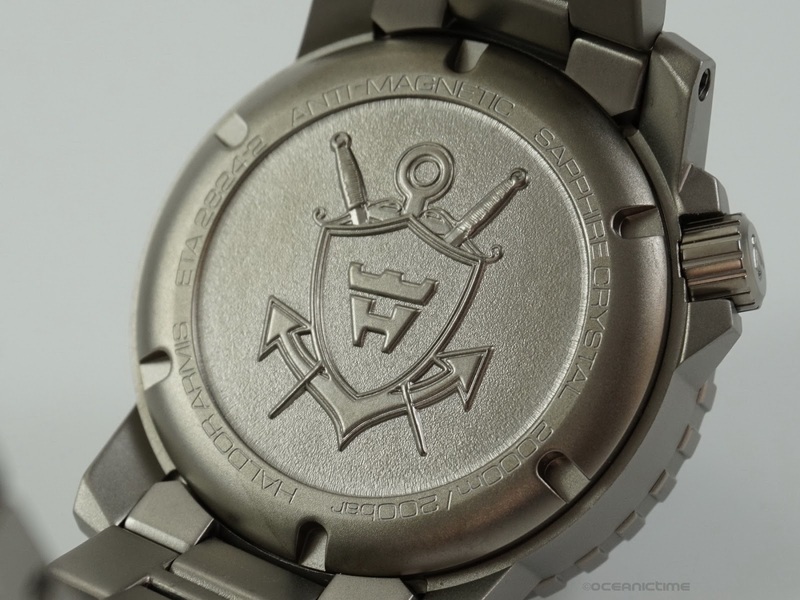 As the hardening process is carried out before the steel cools, it creates a protective layer on the steel, making the surface of the watch significantly more resistant to scratches. DESIGN The Armis has quite a familiar style not so different in its DNA from some other models also designed in Germany as it is. So perhaps we couldn't really say that the Armis brings anything new to the table in terms of style. 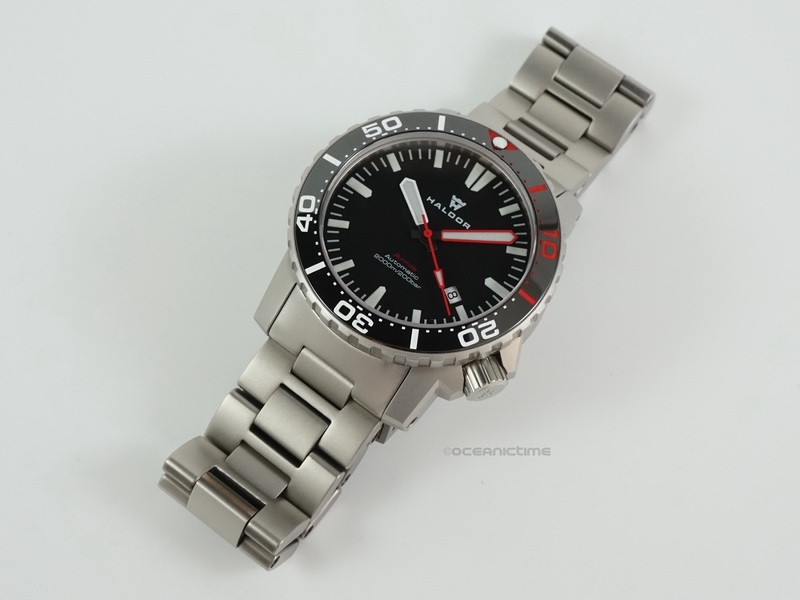 However with that said, the Armis does have a look that has become synonymous with some of the more noteworthy German dive watch brands such as Sinn, Laco or even H20. This is a very rugged yet understated looking watch that should happily satisfy fans of the above brands (Sinn in particular) but who are perhaps on a more modest budget. The watch’s bead-blasted finish as well as the additional HHC surface treatment go a long way to giving the Armis its toolish aesthetic while the glossy black ceramic and flat sapphire crystal help to give it a more premium feel. DIVE The Armis 2000m is first and foremost a diver's watch. 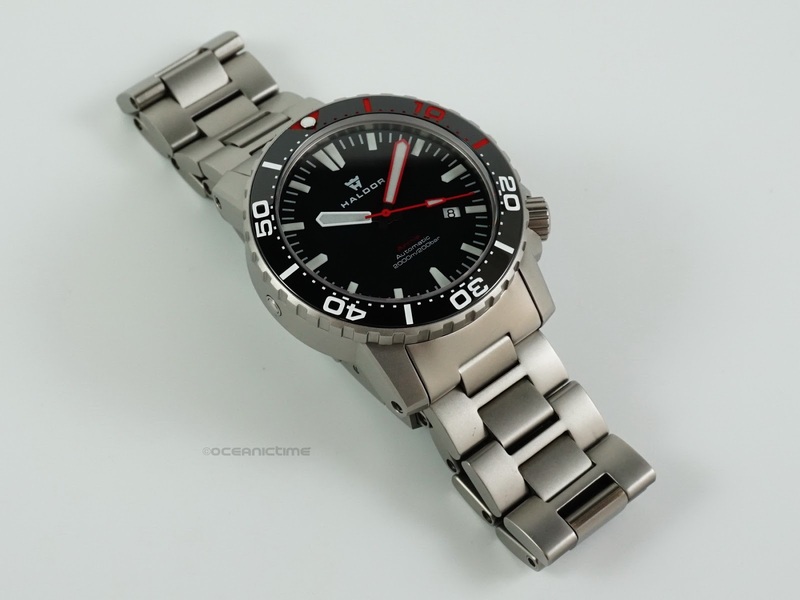 It is endowed with all the types of features that one would expect on a modern dive watch. A 120-click unidirectional bezel with a ceramic inlay and luminous dive-time scale, a 4.5mm thick sapphire crystal with AR-treatment, a Helium Escape Valve (left lateral side), a screwed case-back and crown and a substantial 2000 meters of water-resistance. In addition to the above, the Armis also benefits from Magnetic Field Protection, shielding it from magnetic fields. Its movement is housed inside a Faraday Cage protecting it up to 4.800 ampere per meter (A/m). BACK The Armis case-back is made from solid steel and like all other case components benefits from HHC treatment. 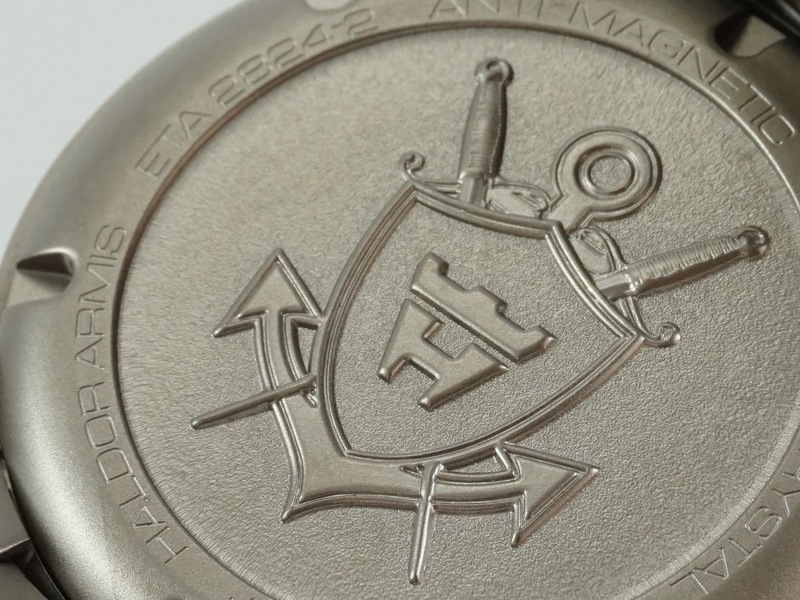 Rather aptly it is engraved with a coat of arms with shield, crossed swords and anchor. DIAL The dial of the Armis is available in any color so long as it's black. This black background creates the perfectly contrasting canvas for its white luminous indexes and its set of broad sword hands. The indexes which are a mixture of rectangular and trapezoidal shapes have been applied with white-colored, Swiss BGW9 SuperLuminova which emits a bright blue light - as have the hands, including the seconds hand. A short and stubby hour hand has been paired with a long red minute hand so that there can be absolutely no ambiguity when reading dive-time. Safe for a white date wheel, white minutes track and a nominal amount of dial text, the Armis has as clean a dial as you could ever wish for. The dial design suits the overall look of the watch, well but personally I find it a little uninspiring. 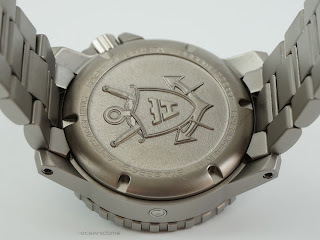 MOVEMENT Haldor haven't skimped on anything on this watch; its movement is no different. Powering the Armis 2000m Ceramic is a Swiss Made ETA 2824-2 in Top grade form which means its accuracy is almost Chronometer-like thanks to its tuning to 5-adjustments. BRACELET The Armis comes on solid stainless steel link bracelet with HHC protective treatment. The links have a sort of H-shape to them; I'm not sure if they were designed like this or whether it was a happy coincidence when Haldor were sourcing the bracelet but it works. The bracelet links are held together by HEX screws rather than nasty old flat-head screws. 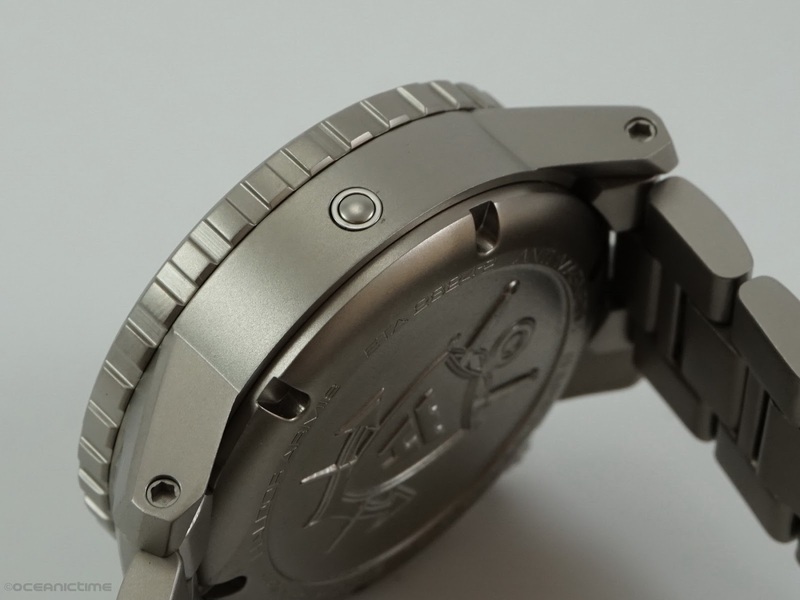 It is fitted with a push-button clasp with a diver's extension. I've encountered tons of similar clasps, this works as well as any of them, but it feels quite light. Not sure if that's good or bad - depends on your personal preference, I guess. KIT The Armis was delivered in what I'd call a medium quality dry case. Inside the case was the Armis along with an additional Italian rubber diver's strap, a tool and warranty card. FIT ‘n’ FINISH What we have in the Armis is a German designed, Swiss made diver's watch produced by a small Slovenian brand. Geography aside, I really can't fault the Armis and as much as I don't like to pick holes in watches (it's my job to do so), I have really struggled today. 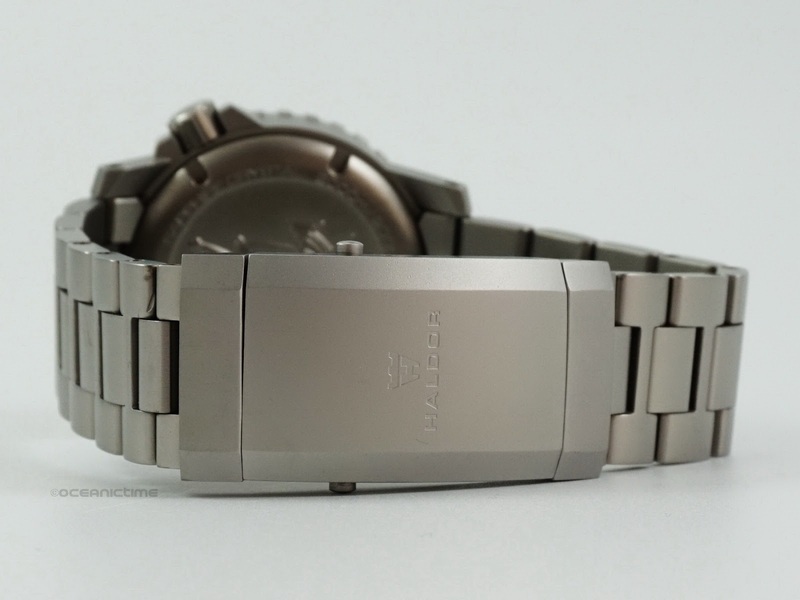 The HHC bead-blasted finish is consistent throughout, even the gaps between the bracelet links look good. The bezel has a nice smooth action (it's not like a Rolex but it's good), the bezel and crown have been tightly secured. Better quality and higher performing HEX screws have been used throughout. Quickly, going back to the case finish (which as mentioned is nice and even) – please be aware that this type of finish is the complete antithesis of bling. So if you want something blingy, the Armis is not it. 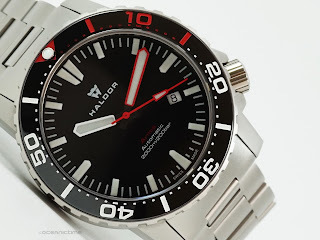 THOUGHTS The HALDOR Armis 2000m Ceramic is without question a very nicely put together and capable dive watch. Stylistically it's a little too safe for me, not boring but kind of generic in its look and a little soulless but then again it should appeal greatly to those with an appreciation for more technical looking tool divers. This is obviously subjective. However, what it lacks in originality it certainly makes up for in terms of features. 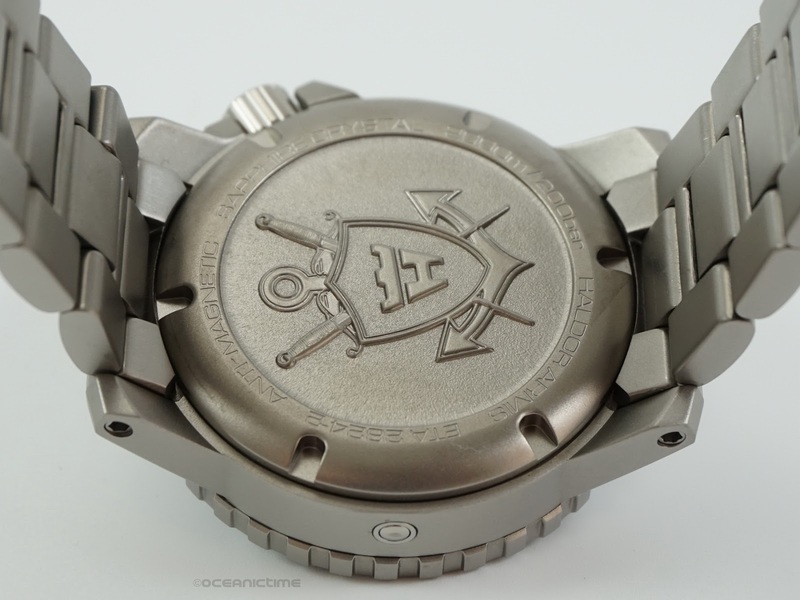 You get a 2000M diver boasting: case hardening treatment, anti-magnetic protection and an ETA Top Grade movement. It even says Swiss made on the dial for those that consider this an important selling point. 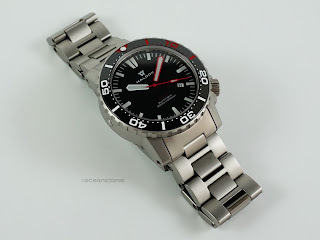 For all its German styling, Swiss manufacturing and Slovenian heritage, it is ultimately a Euro Diver, not a famous one but a good one that offers value. PRICE Talking of Euros, the Armis 2000m Ceramic has a 650 euros price-tag + VAT within the EU. I think this is fairly reasonable asking price considering its high level of specification. If you aren't quite on a Sinn budget, this will certainly go a long to giving you a bit of a taste of what a German tool diver offers. What do you think? This watch was loaned to OceanicTime for the purposes of this review. Follow the link embedded in the HALDOR logo, below for further information.